What am I supposed to serve at a tea party? 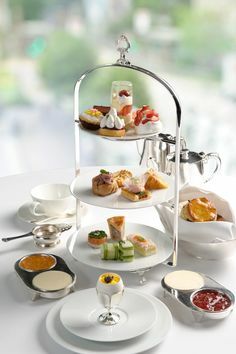 Afternoon tea is traditionally served at low tables and consists of three courses: dainty sandwiches, scones, and a selection of bite-sized desserts. A luncheon tea is more like a meal and often includes soup, salad, and or quiche. And don’t forget to serve tea, one of the most often overlooked ingredient to a successful tea party. My article, “The Steps to Creating Your Tea Party Menu” will take you through the process step-by-step. If you need to pull something together quickly, “The Secret to a Simple and Quick Tea Party” will help you. What’s the difference between green, black, and herbal teas? Herbal teas are not made from the tea plant, and are not actual tea, but herb tisanes or infusions. Black and green tea (as well as oolong and white tea) are from the same plant but processed differently. Green tea has been oxidized less than black which results in less caffeine (15mg vs. 40mg per cup). My article, “The Definitions of Different Types of Tea” will provide you with even more specifics. Where’s the half-and-half? And who was Earl Grey anyway? Half-and-half is too heavy for tea. Tea’s delicate flavor only requires milk for a slightly richer taste. And Earl Grey was Britain’s prime minister in the 1830s. Earl Grey tea is tea that has been flavored with the oil of bergamot, a citrus fruit. Do I have to wear hat and gloves? No. Afternoon tea came into fashion during the Victorian age, when the English women dressed up completely when in public and when visiting friends. However, to enjoy the beauty of the experience, pull something out to wear besides jeans. Little girls, however, love to wear hats, gloves and lots of bead necklaces when taking tea. Why aren’t you curling your pinky? Because curling your pinky when drinking your tea is actually an insult to tea drinkers, used to make fun of us and perpetuate the stereotype that we’re uptight and snobby. 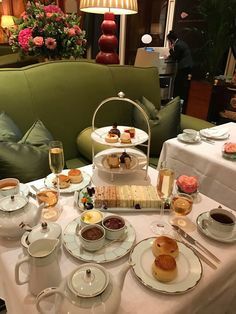 In contrast, afternoon tea provides an elegant way to relax with friends. Where do my guests put their soggy tea bags? Nowhere. Don’t use them. Hostesses, tearooms, and restaurants DO NOT make your guests brew their tea at the table! It makes a mess and they will get a lousy cup of tea. Tea needs to be brewed with the water as hot as possible for the type of tea (boiling for black, less hot for green) and covered while steeping; an impossible task if you only place a teapot of hot water and teabags on the table. And who wants a wet teabag on their saucer, creating a puddle that drips every time the guest raises their cup for a sip? Brew the tea in the kitchen first and serve it as hot as possible to your guests at their table, pouring their first cup. How will I know how to act at a tea party? Just don’t fill your cup to the rim with milk and sugar before tasting the tea and clink the side of the cup with your spoon while stirring your concoction up and you’ll be just fine. Take small sips and bites, ask questions of others more than sharing your own stories and you’ll be a fabulous guest! Relax and enjoy the transporting beauty the afternoon tea party provides. And this, in particular, made me laugh out loud in the airport! People are looking at me as I smile. Thank you for brightening my day! Nice summary. Guess I am a heathen using infusion bags in the evening. We have taken to late night tea after dinner. The problem here is that we do not have a source for bulk teas except for a place that I refuse to enter based on the bad behavior of the owner. So, whine…whine…whine…do you know of any good online sources? Also, looking for a good scone recipe–the last ones came out like biscuits (cherry almond).